Elements Applied: Seeds and roots are commonly applied in herbal medicine. Active Components: The majority of active components, including terpenoid anethole, can be taken from the volatile oil. Terpenoids like anethole are characterized by actions similar to estrogen, while being potent to reduce smooth muscle spasms (for instance, bowel spasms). According to recent researches, fennel is known to induce urination, promote bile excretion, reduce pains, fight fevers, and treat bacterial infections. History: According to several historical references, it was fennel that gave immortality in the myth of Prometheus, referring to Ancient Greece. Before Christ fennel was applied as a remedy for bowel colic in infants. Later one, fennel was prescribed by Discorides for decreasing appetite, while its seeds were applied to increase lactation. Fennel was part of 22 medicines, made by Roman herbalist Pliny. According to Pliny, fennel helped cure eye diseases, and even blindness. Moreover, fennel was believed to cure jaundice. Fennel seeds were conventionally applied in cooking, especially for spicing fish. Some nations use fennel after meals to impede stomach complaints and constipation. Latino-American women employed fennel as a lactation-inducing remedy. Used For: The herb is known to treat stomach conditions, induce perspiration and urination, treat flatulence and respiratory conditions. Additionally, fennel is highly valued for its aromatic properties. The list of conditions in which fennel is employed includes irritable bowel syndrome, indigestion, and colic. Tea made of fennel is conventionally applied as an eye wash. According to clinical studies, it can be applied for spasms, colic, cramps, gout, stomach acidity, and flatulence. 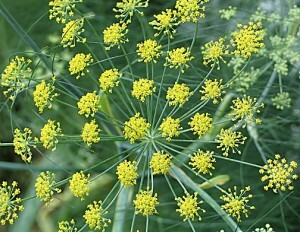 Pounded fennel seed employed as tea is thought to heal insect and snake bites, as well as relieve symptoms of poisoning. The herb is successfully used for obesity. It boosts urination and helps regulate weak menstrual discharge. Conventionally, fennel oil is distributed over aching joints to reduce pain. As a gargle fennel was applied for sore throat and hoarseness. Fennel is employed as a gastro-intestinal relaxant, soothing spasms in the smooth muscles of intestinal tract. Additionally, it helps relieve flatulence and fight microorganisms. In Germany, fennel is used like anise and caraway as a treatment for indigestion, gas pains, and infant colic. Fennel is highly beneficial for female problems. It is used to induce menstrual flow in females. According to several researches, fennel is believed to imitate estrogen activity (functioning like estrogen). For this reason fennel may be applied for boosting lactation in breastfeeding women and regulating menstrual flow. Additionally, it can be applied to soothe menopausal pains in women. Additional Info: Fennel belongs to perennials and is indigenous to the Mediterranean countries and Asia; still it’s specially raised in Europe and the USA. The root is long and resembles a carrot. It stem is thick and covered with stripes. The leaves are complex, having several segments, with the upper ones surrounding the stem. The plant blossoms from midsummer to late autumn, and features yellow-colored flowers. The fruit is composed of two carpels, which are oblong in shape. Preparation and Intake: Seeds can be chewed naturally or added to tea. To prepare tea, use half a teaspoon of pounded seeds for a cup of water and boil it up for 10 to 15 minutes. The boiling volume should be covered. Cool the result, filter it, and take in a quantity of three cups a day. In form of tincture the remedy is applied at a dose of 2-4 ml thrice a day. Safety: Fennel does not produce any serious side effects on the body. Nursing or pregnant women, in addition to people with estrogen-triggered cancer, should not used fennel in considerable amounts till it becomes evident the herb can be effectively used as an estrogen substitute. Moreover, individuals who suffered from hepatitis, or any other liver condition, or consumed alcohol on a regular basis, should also use the herb with extreme care, as its effect on the liver has not yet been properly investigated. Fennel seeds are generally safe; however, there are anecdotal reports of sensitivity to fennel oil. It was said to result in skin rashes. If used internally fennel oil can possibly lead to seizures, vomiting, and sickness.